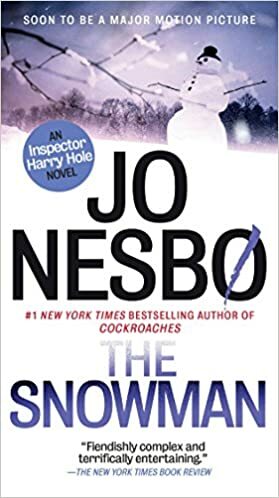 Harry Hole (pronounced “hoo-leh”) is an Oslo police detective. His colleagues often joke that he’s a specialist in serial killers, even though Norway has never had a serial killer case (his expertise comes from visits abroad). But now they’ve got one. They just hadn’t realized it. Every year, when the first snow falls, a woman disappears. She is always a wife and a mother. Because the disappearances happened in different cities, the police never put the cases together. Now Harry Hole, assisted by an attractive new partner, discovers the connection. This will lead them on a hunt that will touch Harry personally. There are multiple red herrings. The climax is thrilling but implausible, perfect for a movie (and indeed a movie has been made of this book). That’s followed by an epilogue that, frankly, made no sense at all to me. Author Nesbø has stated that Michael Connelly’s Harry Bosch was an inspiration for Harry Hole. Maybe. But Bosch is a far more appealing and principled character. Harry Hole is a self-destructive alcoholic who pushes all love out of his life. I can’t find a way to like him. And the action at the end of the book was over the top and confusing. The Snowman is an exciting read, and it’ll keep your interest. You may like it more than I did. Cautions for language, adult situations, and gore. I heard the movie was stupid and kinda gross. Plus no one how to pronounce the hero’s name. Actually, I should say many viewers found the movie a terrible mess.